7/23/2014: I thought I’d repost this classic on the meetings of Dave Hubin’s working group to hide public records. From what I can tell this group has now accomplished its mission and is defunct. 6/5/2013 meeting, page down for 3/7/2013 meeting. Last meeting (see below) was a disaster for Hubin and Thornton, who got raked over the coals and revealed that there were serious problems with the office’s decisions about fee-waivers, bad software, refusal or complete inability to answer questions about policies, inconsistent statements, no decision on the STC recommendation for fee-waivers for student journalists. 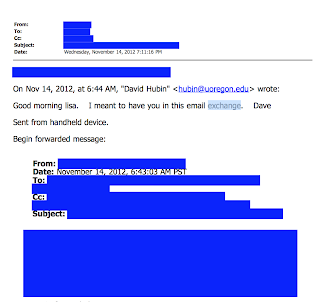 Dave didn’t even tell UO’s student-journalists that the meeting was being held, they found out about it from UO Matters. Faculty and students not allowed to ask questions. Thornton killed a bunch of committee time with irrelevant numbers, worked well. No progress on public-interest fee waiver policies. Still a black hole. Thornton’s statements just added to the mystery of what current policy is. Still seems like she has *never* given a full fee-waiver. In Feb the STC voted unanimously to recommend Gottfredson waive fees for student-journalists, up to some reasonable limit, with Hubin to determine what’s reasonable. Gottfredson won’t do it, claims he’s studying the issue. He was provost at UC-I, where there are no fees for anyone (except for computer programming time, if that’s required.) So Gottfredson already knows how well this would work, and he just doesn’t want the students to be able to get information on how UO is spending their money. Live-blog disclaimer: My opinions on what people said or would have said, if they only had a spine. You should be embarrassed by what you’ve said and not said here Dave. And also by what you’ve done, and not done about public records and transparency. For starters, you said that the meetings of your PR AAG – which you set up to subvert the Senate Transparency Committee – would be open to the public. But you’ve never even told UO’s student journalists when the PR AAG meetings would be. I found out about them by being persistent, and then told the reporters and posted the times and locations on UO Matters. At the last meeting you wouldn’t even let the student reporters ask questions. Your 72% number for no fees is padded by including the many requests where the PR office simply forwards a link to an existing document. How many times has UO waived fees on the basis of a public interest claim since you’ve been in charge of the PRO office? You do waive fees for what the office considers to be simple requests. Or should that be “un-embarrassing public records”? Because you’re still stalling and trying to charge the students $240 to see Gottfredson’s official calendar. That’s just bizarre. You claim that response times are decreasing. Again, that’s because you include requests for things like coaches contracts, which are online. For anything else, it’s typical to wait two weeks, or longer, to get a response. Often there is no response at all until I petition the DA’s office. And even then responses typically involve a hefty fee and no substantive explanation for the fee-waiver denial. The office gets about 1 request a day – including the trivial ones – and has a budget of $240K and 2-3 staff. They can do better. You and PR Officer Lisa Thornton attempt to justify these delays and fees for student-journalists by saying that’s the way the real world works, and dealing with these obstructions from their university is helping their education. Insulting. I know that running the PR Office is not a job that you sought, or enjoy. But you’ve become a hypocrite about it, and you are now far to comfortable and facile with that role.